Designed by architecture studio La Shed, the house in Saint-Lambert is built where the original guest quarters were constructed in 1890. Jean-Luc Gagnon and Marie-Hélène Larouche live in their soon-to-be former backyard. No, this is not a story of evictions gone wrong, squatting or any other malady (asbestos, bed bugs) that might force someone to abandon their home and seek refuge at the rear. For much of the past decade, Mr. Gagnon and Ms. Larouche shared a trim, 1910 brick pile in the tony Montreal suburb of Saint-Lambert. After purchasing the three-bedroom, 1,200-square-foot home, they spent six years expertly restoring it, highlighting the Edwardian attributes, including the elegant mouldings and original woodwork. During the renovation, they periodically stayed in a small, one-bedroom hut at the back – a vestige of the home's history. The 600-square-foot guest quarters dated to 1890. It's where the original owners lived until they could afford to build a grander structure on the 6,000-square-foot lot. The grey custom kitchen is sleek, with thin counters and stainless steel accents. Erecting such a backyard dwelling was common in Quebec a century ago. But most similar structures were torn down, expelling any reminders of the humble stops sometimes necessary to achieve middle-class accommodations. The one on Mr. Gagnon and Ms. Larouche's property was very useful, though. Sometimes, the couple rented it out to tourists, which "helped pay for the renovation," says Mr. Gagnon, a trumpet player with the Montreal Symphony Orchestra. And sometimes it was simply a refuge. "It felt like going to the chalet," he says. "There are trees all around." They liked the experience so much that they decided it would make more sense for them to downsize from the big house and move into the backyard. "We wanted to have a pied-à-terre that we could maintain easily so we would be free to travel and do other things," he says. Italy, France and Japan are favourite destinations. Many municipalities, including Saint-Lambert, frown on building new out-back flats, fearing the added density or the change in curbside aesthetic. But because Mr. Gagnon and Ms. Larouche already had one, they were allowed to expand on and improve it, within limits. They couldn't extend the size beyond 950 square feet and they couldn't deviate from the conservative character of the neighbourhood. To build their new place, they listened to the recommendation of a friend and engaged architecture studio La Shed, a young firm that in 2016 won the prestigious Emerging Architectural Practice award from the Royal Architectural Institute of Canada. "We had to wait a full year for La Shed," Ms. Laroche says of the growing popularity of the firm in Montreal. "But for us, it was La Shed or nothing. It was worth the wait." For the design, "we tried to keep the ambience of the little place that was here before," says architect Yannick Laurin, one of La Shed's co-founders. "The floors and ceiling are pine, for example. The white stucco on the exterior is what was there before." Throughout, though, it's hard to imagine it was ever rustic or cabin-like. The grey custom kitchen – a favourite spot for Ms. Larouche, who loves to cook – is Ferrari sleek, with its razor thin counters and stainless steel accents. Cool, contemporary details abound, such as the LED lights almost imperceptibly inset into the pine slats. "We call them our Star Wars lights," says Mr. Gagnon, noting how they are invisible during the day, but have a light-sabre glow at night. 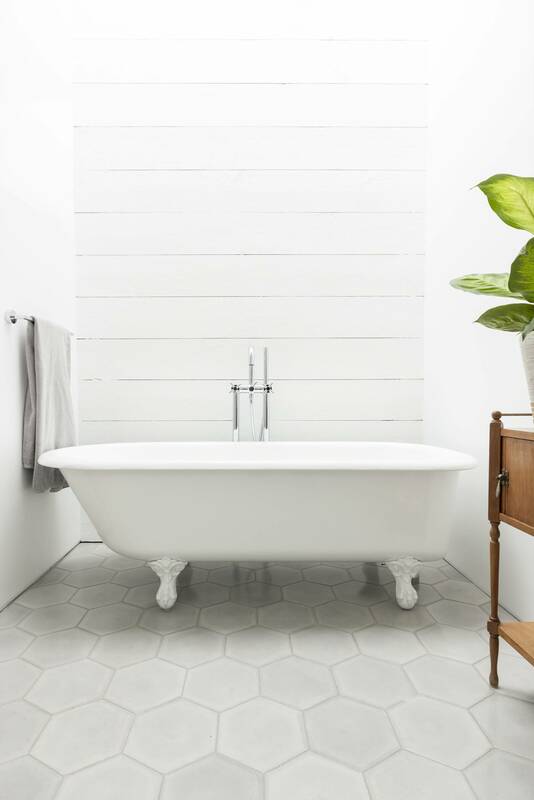 The bathroom features a classic claw-foot bathtub and barn-board walls made from salvaged wood from the original hut. The bathroom, adjacent to the simple, spare bedroom, is the most throwback space. It has a classic white claw foot bathtub and barn-board walls made from salvaged flooring from the original hut. Even there, there are smart mod-cons, such as the world's most silent exhaust fan. It's tucked into a discrete slit above the shower door and makes virtually no noise. "But it works," Ms. Larouche says. For Mr. Laurin and La Shed, the biggest challenge was creating a sense of privacy, especially knowing that the original lot would be split, and the front house sold to someone else. Many prospective buyers wouldn't leap at the idea of having the previous resident living in their backyard, especially if that would mean having a literal window into their lives. La Shed was very careful to configure the new building to maximize seclusion. There is only one small window in the flat that faces the original backyard. The main living spaces, including the kitchen, dining area and a sunken living room, all face the other way, toward a hidden patio and courtyard. "All you really see is trees," Mr. Laurin says. "It's very private." The main living spaces, including the kitchen, dining area and living room, all face toward a patio and courtyard to maximize privacy. To minimize the appearance of the overall structure, La Shed played with scale and proportion. The front of the building is more than 14 feet tall, but only has one sash window, a style chosen to suit the neighbourhood. It's a sizable opening, but "since we only used the one window, you don't necessarily read the scale of the structure from the street, Mr. Laurin says. "It looks very tiny. It's only when someone stands next to it that you get a true sense of the scale." Even the access is as unobtrusive as possible. The driveway is paved with permeable, grass-filled planters, so at a glance, it just looks like lawn. "Some people who came to look at the house at the front were concerned about being so close," Mr. Gagnon says. "However, most people coming from Montreal are used to the tight proximities." As for Mr. Gagnon and Ms. Larouche, they would not be happier with the finished house. "Not even if someone offered us a million dollars would we sell this place," Mr. Gagnon says with a smile, as sunlight floods in the courtyard windows. "Because it's not just the value of the property, but what the property means to us. Living here is like a dream."